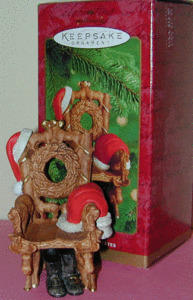 Hallmark Santa's Chair Christmas Ornament Copyright 2000 Santa's red hat, jacket and black boots indicate that he is taking a well deserved break from working on his list of good boy's and girl's. 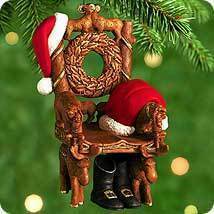 The detail of rustic carved chair with elves embracing bears for the arms, majestic moose standing tall for the legs, dall sheep towering overhead and elk beneath the wreath make it a master piece that any child would look forward to hanging on their tree for years to come. New in Box!